Ideal lip care for inclement weather. 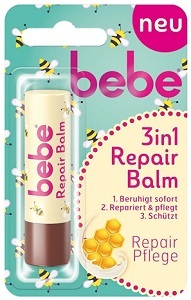 Bebe 3-in-1 Repair Lip Balm has a multi-function formula containing Shea Butter, Aloe Vera and Bee's Wax that quickly and effectively helps lips in 3 ways: 1) soothes dry lips, 2) cares for and repairs chapped lips, and 3) protects lips from harsh environmental conditions such as wind or cold. From the first application, it works to restore a feeling of welll-being to your lips. Skin compatibility dermatologically confirmed. From the same company that makes Penaten products, Bebe offers a wonderful line-up made only from the highest quality ingredients which will keep both the children and their parents happy, healthy and clean! Packaging and instructions in German language only!